On 16th October CEJ held a press conference to announce the activities of the week of action. 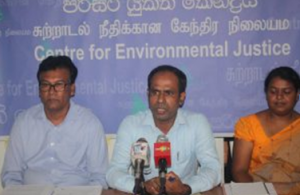 CEJ reminded media on the harmful effects of Lead and sources of lead poisoning in Sri Lanka in addition to the activity plan for the week of action. 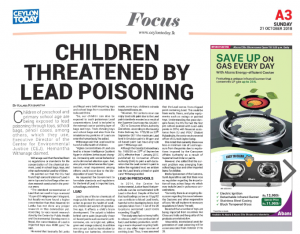 Also, CEJ urged health, environmental and consumer agencies to take measures in preventing lead poisoning from lead paint, lead contaminated toys, lead acid batteries etc. A press release was issued to the media absent for the conference (annexure 1). The news was covered in 4 printed media and 2 electronic media. On 18th Mr. Hemantha Withanage had a program on the lead week of action and lead poisoning with the SLBC (Sri Lanka Broadcasting Cooperation). Ms Udayarani Wickramasinghe interviewed him on lead and the activities planned for the week of action. He further mentioned the activities carried out under the Asian lead paint Elimination project in association with IPEN and EU and how it facilitated in creating a lead safe paint market in Sri Lanka. 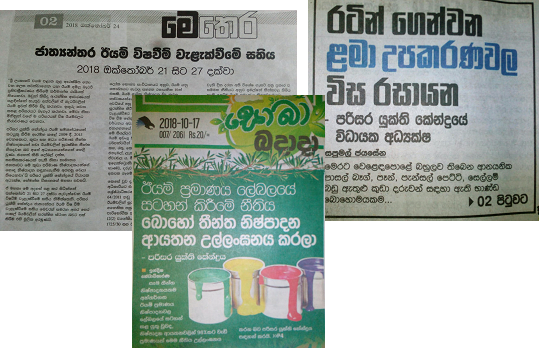 By today Sri Lankan paint industry is regulated by two laws; on limits of Pb concentration and label standards (annexure 2). 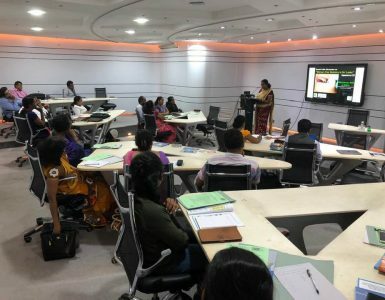 In celebrating the International lead poisoning prevention week of action- (21 to 27 October 2018) Centre for Environmental Justice (CEJ) took initiatives to make more pre-schools lead safe. In 2014, CEJ revealed in a study that pre-schools can contain up to 600 micrograms of lead per square foot, when studies have shown that lead loading as low as 10 micrograms per square foot can effect a child’s brain development. In the absence of other lead sources, it was concluded that this lead in dust came from the chipping lead contaminated paint from walls (murals), floor, playing equipments (swing/ sea-saw, etc.) and toys. Therefore in order to prevent lead coming into dust, CEJ initiated forming lead safe pre-schools by painting them with Lead safe paint along with awareness raising. Implementing the 4th paint distribution program, CEJ organized this event at Dehiattakandiya in association with Macksons Paints Lanka (Pvt) Ltd, with around 200 participants representing government agencies, the base hospital, schools, education officials, teachers, parents and students. Demarking the opening of the event Mr. Dilena Patragoda, Managing director, CEJ explained the history of CEJ and lead paint. 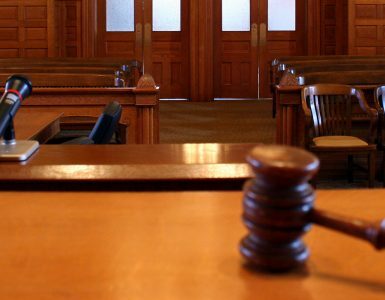 He recalled the court case filed by CEJ in order to bring legal standards to lead concentration in paint. Mr. Hasodh Samarasinghe spoke on behalf of the Macksons Paints Lanka (Pvt) Ltd and Ms. Chalani Rubesinghe, Senior Environmental Officer of CEJ spoke on the measures to be taken for preventing lead poisoning in pre-schools and household environments. Many participants including the Assistant director of education (early childhood development), Sub Police Inspector, A school principal, parents, teachers and students were thankful for both the donation and the awareness program. In total 15 pre-schools, a children’s home and the office of Medical Officers of Health (MOH) received lead safe paint. In conclusion, Mr. Gamini Piyarathna, Assistant field Coordinator of CEJ, thanked the representatives of Macksons Paints Lanka (Pvt) Ltd and the other participants for their contribution in successful implementation of the event. Signing of the MOU between the base hospital of Dehiattakandiya, CEJ and Macksons Paints Lanka (Pvt) Ltd was held at the Base hospital on the same day. The agreement was to paint the children’s and the maternity ward of the hospital. Donations from Mayura paints Lanka Pvt Ltd. was given to “Sooriya” pre-school, Sooriyapokuna, Dehiattakandiya, that of Burlux Paints Lanka Pvt Ltd. was donated to Subodi pre-school, Dalukkatiya, Sewanagala, that of Lanka paints solution Pvt Ltd. was donated to Mihindu pre-school, Mihindupura, and paints from Royal paints Lanka Pvt Ltd. was donated to “Rosakusum” Pre-school, Mahasenpura, Uwa Palwatta, Moneragala. CEJ had a sticker distribution event at main bus stand of Colombo to widen the awareness among general public. Many busses and timekeepers welcomed the message. Even people who are merchandising small items pasted the sticker on their baskets to help spreading the message. Sri Lankans now can enjoy lead safe paint due to the lead paint standards enacted as a result of the Supreme Court case No 64/2011 – CEJ vs Consumer Affair Authority and others case filed by the Centre for Environmental Justice. 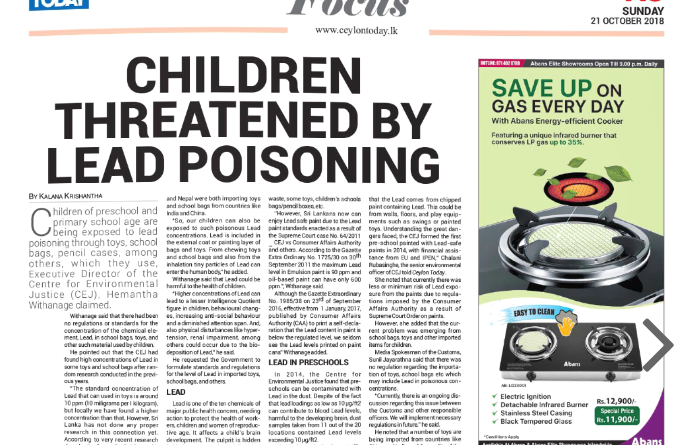 According to the Gazette Extra Ordinary No 1725/30 on 30th September 2011 Maximum lead level in Emulsion paint and paints for children’s toys is 90 ppm while oil based paints (Enamel and floor) can have only 600 ppm. The Gazette Extraordinary No. 1985/38 on 23rd of September 2016, effected from 01st January, 2017, published by Consumer Affairs Authority (CAA), mandates to print a self-declaration that the lead content in paint is below the regulated level (figure 2).